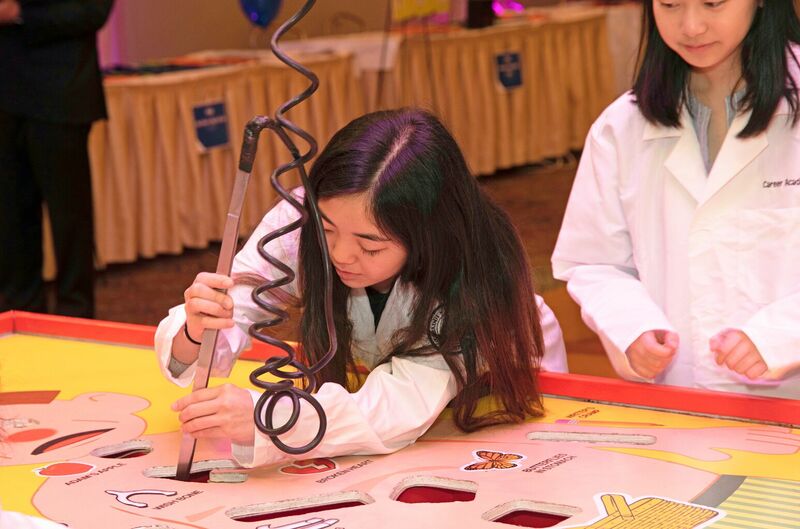 A student tests her skills on a life-sized game of Operation at Northwell Health's SPARK! Challenge. Northwell Health’s fifth annual SPARK! Challenge culminated with an awards presentation involving 900 students from 47 school districts across the region at the Crest Hollow Country Club on April 11th. SPARK! Challenge is a year-long career initiative providing high school students the opportunity to learn about careers requiring science, technology, engineering and math (STEM) skills. The program was created by Northwell's Workforce Readiness team. "This year’s SPARK! Challenge was the largest since the program’s inception, with 900 students participating," said Cheryl Davidson, senior director of Workforce Readiness within Northwell Human Resources. "They want to learn and discover what a career in health care could offer. They’re able to get hands-on experience in clinical and non-clinical areas so they can choose the direction they want to go — the possibilities are limitless." SPARK! Challenge teams presented their projects to Northwell’s senior leadership at the awards celebration and participated in hands-on activities at the event. Experts representing more than 75 health care fields hosted students for a day in the fall and served as mentors to encourage students to consider high-growth and non-traditional career paths in health care. Winning teams for Posters: First place John F. Kennedy HS, Bellmore-Merrick, Second place General Douglas MacArthur HS, Levittown, Third place Valley Stream Central HS.